Stylish functionalism with the music in the center on top of the Avenue. In Google Maps, you can move around in our public areas – foyers, Stora salen (the main hall), the more intimate Stenhammarsalen and the box office. 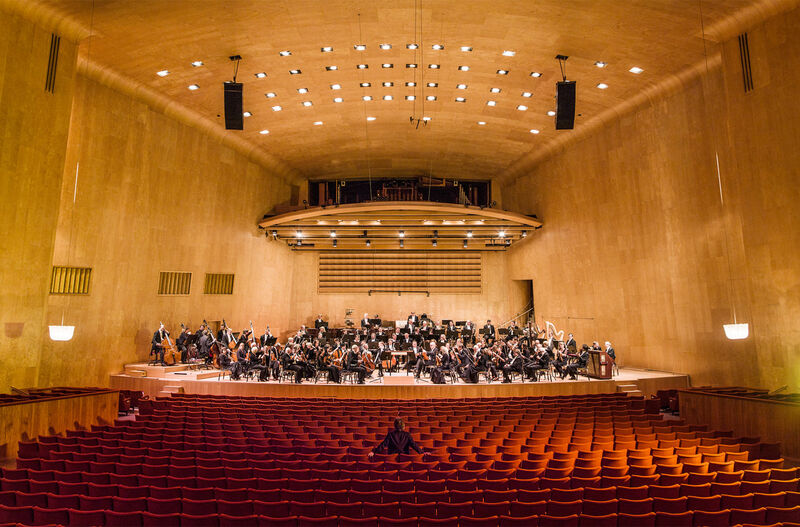 Concerts are performed in the Stora Salen concert room, a magnificent hall that is world-renowned for its excellent acoustics, and in the more intimate Stenhammarsalen concert room, which is gracefully decorated with elegant inlays. The building also has many artistic treasures to gaze upon. Sven X:et Erixson, Britt-Marie Jern and Nils Wedel are some of the artists behind the works. The restaurant has a varied menu with high-quality food that has a local connection and is good value for money. As far as possible, the ingredients used are locally produced and organic. 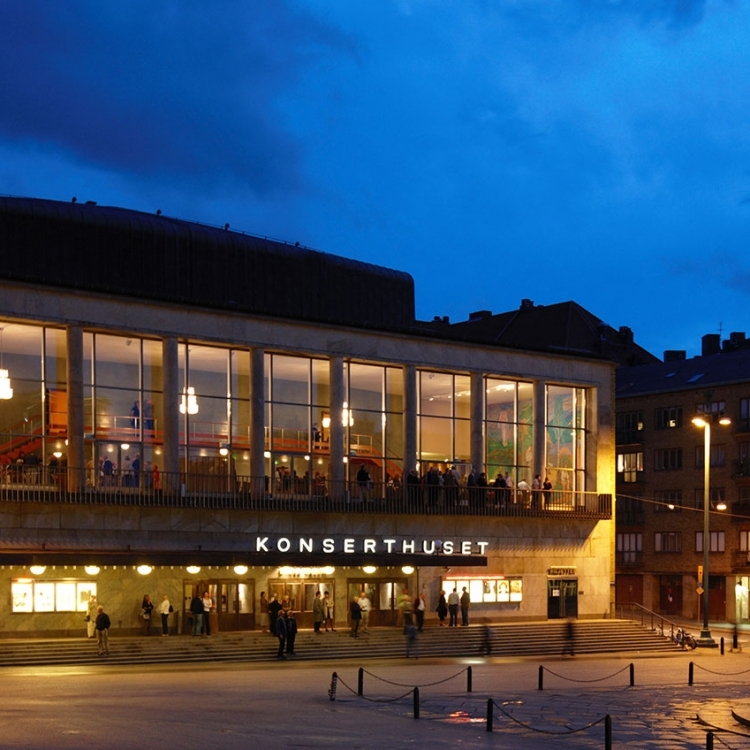 If the music-loving middle class of Gothenburg – merchants, factory owners and ship-owners – had got what they wanted in 1901, the Gothenburg Concert Hall would have become a traditional shoebox, like the Musikverein in Vienna, located where Vasakyrkan stands today. 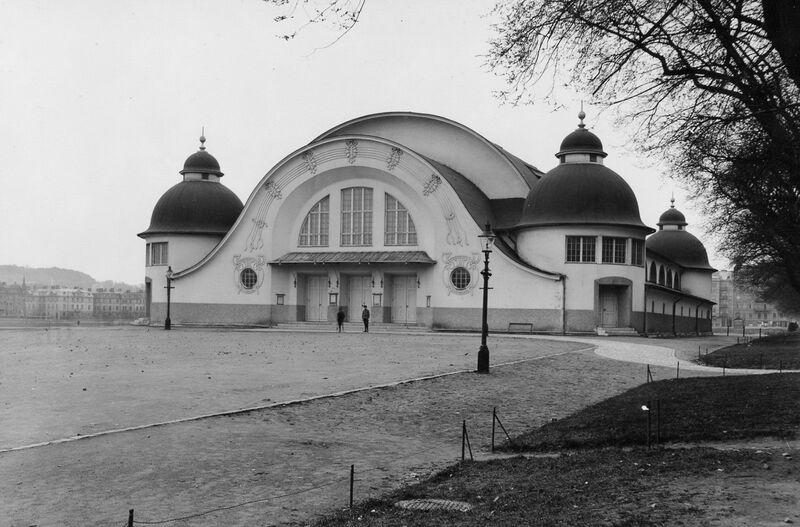 A substantial donation of 700 000 kronor from Caroline Wijk became the starting point for a new concert hall, located at Götaplatsen, as the old building at Heden had burnt down in 1928. In addition to the Stora Salen concert room, there is one more concert room in the building, the Stenhammarsalen concert room, whose balcony is attractively decorated with wood intarsia. “A crab in a rectangle,” is how the architect Nils Einar Eriksson described his building. The crab is the large concert room, designed according to the principles of acoustics to create a room for musical experiences. The rectangle is a cultural building that forms a dignified part of the city’s handsome public square and place for celebration; Götaplatsen. In a newspaper interview in 1932, right at the beginning of the project, Nils Einar Eriksson described his idea this way: “The style is not uniform, but the simple, clear lines are obvious. It is in the air. The intention is that the entire work, for example the great hall, are to emphasise democracy.” Movement to music is another pure theme that permeates the architecture of the building. 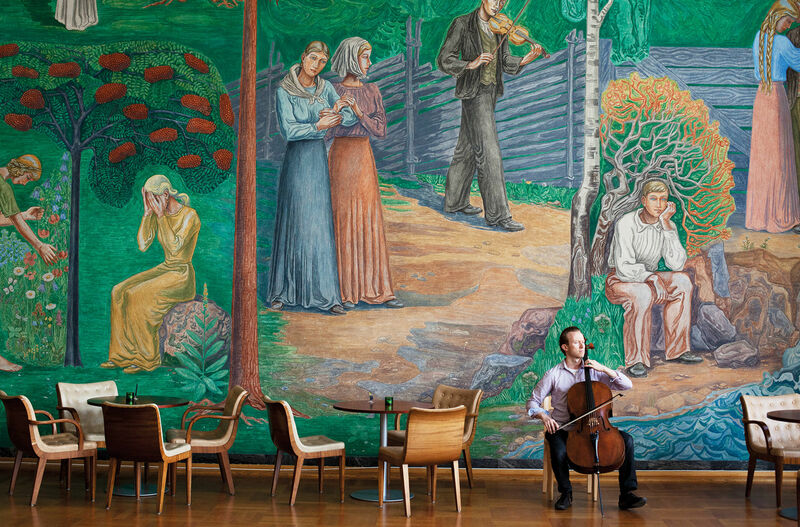 On the walls of the Götaplatsfoajén foyer, there are, for example, Otte Sköld’s fresco painting Folkvisan (the Folk Song) and Sweden’s largest tapestry – Melodier vid torget (Melodies at the Market) – with a design by Sven X:et Erixson. Outside the entrance to the Stenhammarsalen concert room hangs Nils Wedel’s painting Musikanter (Musicians).